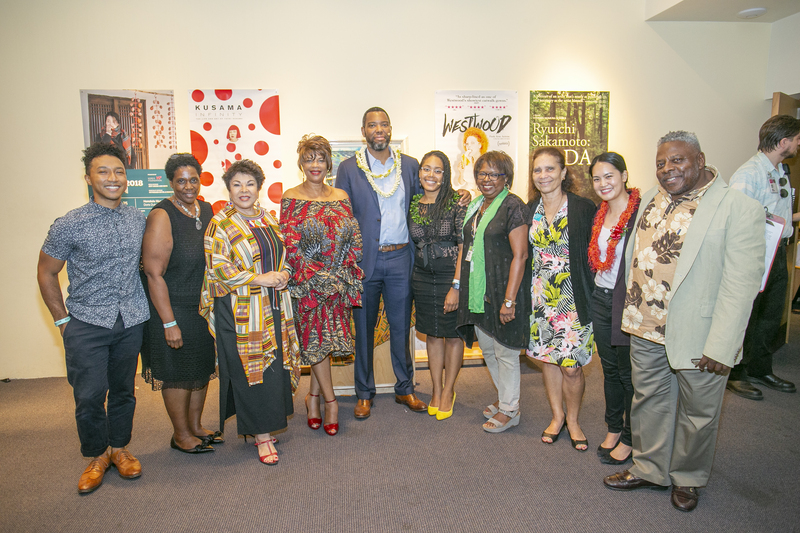 The Honolulu Museum of Art hosted Ta-Nehisi Coates in Conversation as part of the Honolulu African-American Film Festival 2018 program in celebration of Black August. 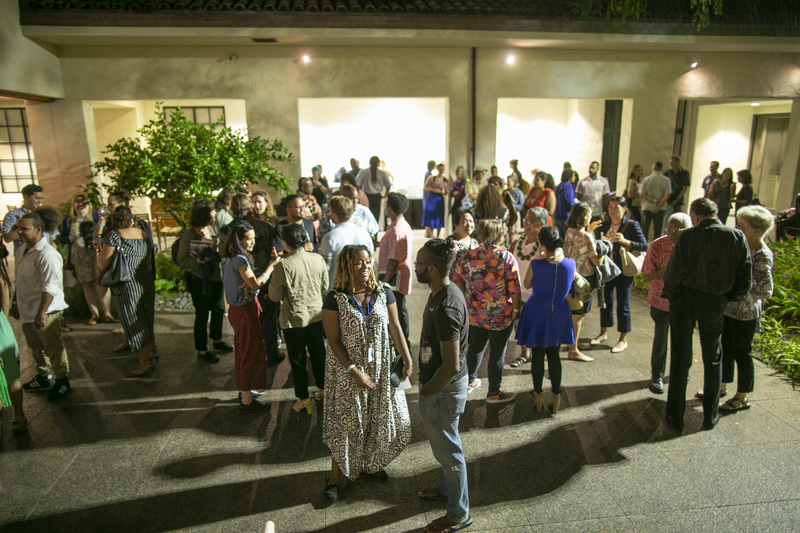 Sponsored by The Pōpolo Project and moderated by the Founder and Director of The Pōpolo Project Akiemi Glenn, the two-part event aimed to explore the liabilities and boons for better understanding the intersection between the experience of Blackness in the Pacific and the experience of Blackness in the continental United States. 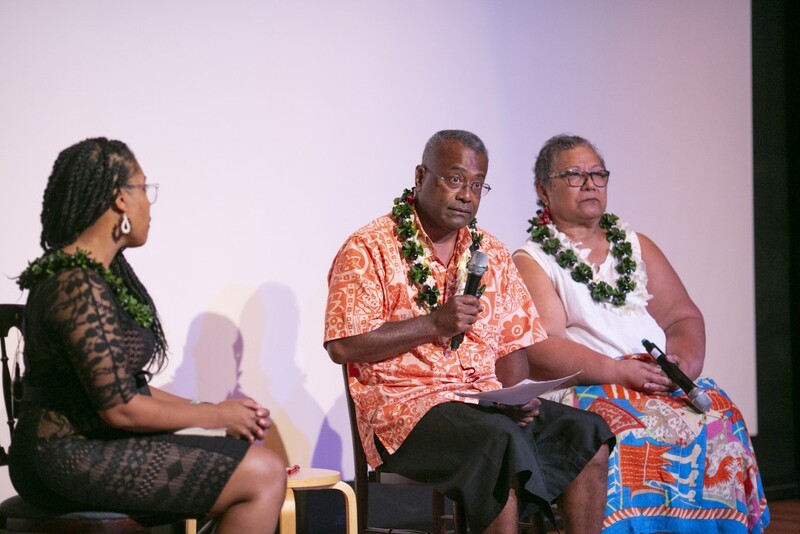 The conversations aimed to address the question, “Can we better understand American racial politics and future if we further examine Hawai‘i’s position within this intersection?” Below are some highlights from the event. 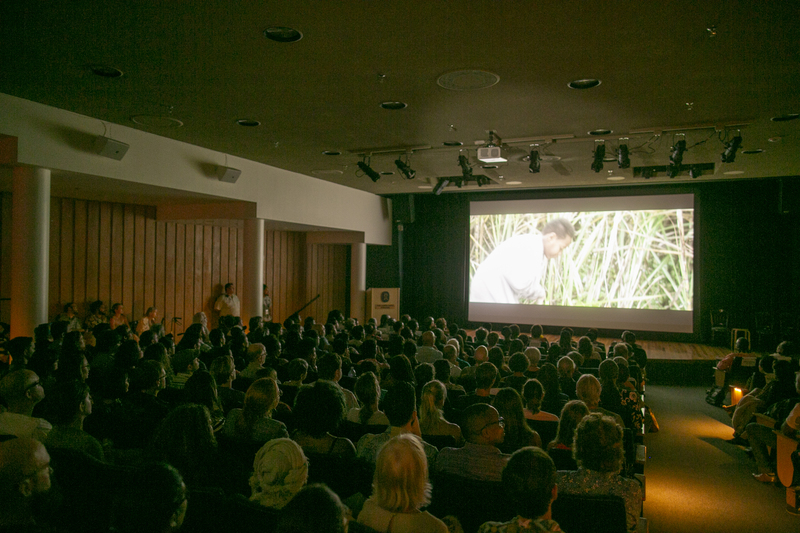 The presentation of two short films served as primers for conversations contrasting a Black experience in the Pacific and an African-American experience in Hawai‘i. Blackbird, written and directed by Australian Solomon Islander Amie Batalibasi, tells the story of Solomon Islander siblings Rosa & Kiko who were kidnapped from their island home to work on a sugar cane plantation in Queensland, Australia in the late 1800s. Blackbird situated the historical realities of slavery in the Pacific so that we could think about how that history reverberates into the present day. A post-screening talk emphasized that the concept of Blackness in the Pacific takes on complex forms from an indigenous perspective: Dr. Ponipate Rokolekutu who researches the economic marginalization of iTaukei (Native Fijians) in the colonial experience and has contributed critical perspectives on the political impacts of the notion of “Melanesia” or a “Black Pacific” as a unifying identity in Pacific politics, was joined by Dr. Luafata Simanu-Klutz whose research, poetry, and playwriting focus on the often unknown aspects of Pacific women’s history, especially in political representation and empowerment in resistance to colonial forces. The short film Healing Traditions, created by The Pōpolo Project, a multimedia exploration of Blackness in Hawai‘i and the larger Pacific, localized the Black experience to Hawai‘i. It provided an optimistic view that healing from historical trauma is possible and that, in the Pacific, our relationship to the ocean is an important catalyst for that healing process. The film follows activist and Hawai‘i-based member of Black Lives Matter Prentis Hemphill as she describes her experience learning how to swim. 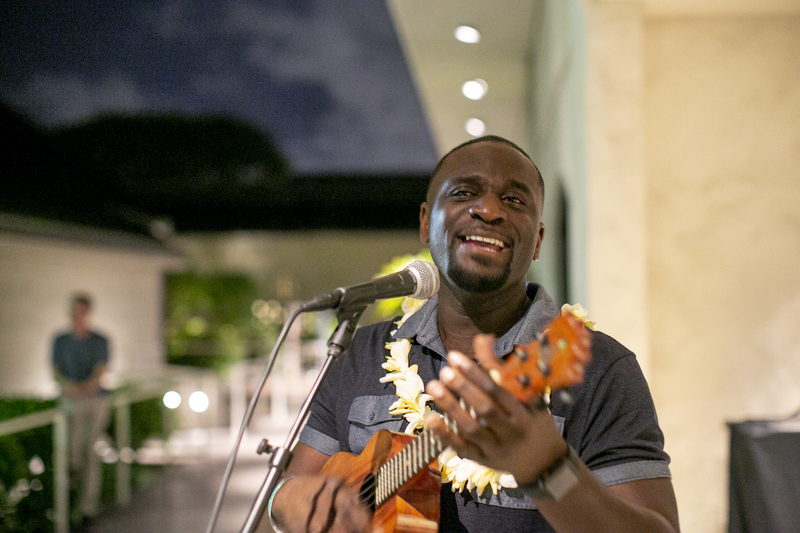 As moderator, Dr. Akiemi Glenn, founder and curator of The Pōpolo Project, wove connections between the first and second talk, unearthing intersections between the Pacific, Hawai‘i, and African-American experiences. 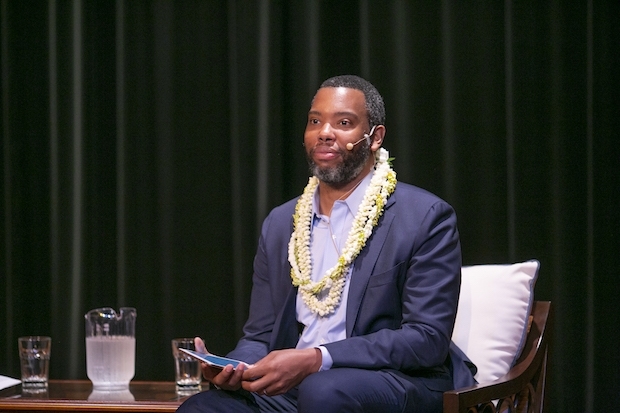 When featured speaker Ta-Nehisi Coates joined Glenn on stage, it was eye-opening to see how the topics Coates addresses in his work – such as housing issues, reparations, and his analysis of Barack Obama – applies to the conversation of race and community in Hawaiʻi and the larger Pacific. Coates went on to remark on how systems of oppression as human constructs became more clear in his travels abroad: “What you see is that these systems are made, they don’t evolve….Human beings decide X, Y, and Z is going to be true and then results flow out from that. And so if they can be made, then in fact they can be unmade.” In the exchange of ideas that followed, Coates and Glenn questioned existing mythologies in American history and the extent to which myths can be re-invented or unmade in order to reconstruct ideologies of race and identity. Glenn situated Hawaiʻi within an American historical context, sharing her view on the reverberations of the American Civil War on Hawai‘i’s history: “For me, part of what seemed to happened after the Civil War is that the United States wanted to have a national project together—pushing the boundaries of empire seemed to be a really important one. And so, thirty years later after the end of the Civil War, we see 1898 [Spanish-American War], we see the [American influence in the] Caribbean, we see [American influence in] the Philippines, and we see Hawai‘i being involved in part of that project,” evoking the overthrow of the Hawaiian Kingdom and the American Occupation of Hawaiʻi. She went on to articulate how issues of incarceration and criminalization take shape in Hawaiʻi as it does in North America: “We’re in the midst of a housing crisis. Here as elsewhere, what happens is that poverty is criminalized. We have a criminal justice situation here, in terms of where our incarcerated people are. The Sagauro Correctional Center is in Arizona. The majority of our incarcerated males are there instead of here in Hawaiʻi, and a majority of those males who are incarcerated are Hawaiian and Pacific Islanders. Those stats are very similar to what we see with Black people in the U.S. and North American context. We’ve been having this conversation about what empire looks like, creeping, and these are systems that have been made.” She asked Coates about his perspective on the expansion of the carceral state in America and elsewhere. 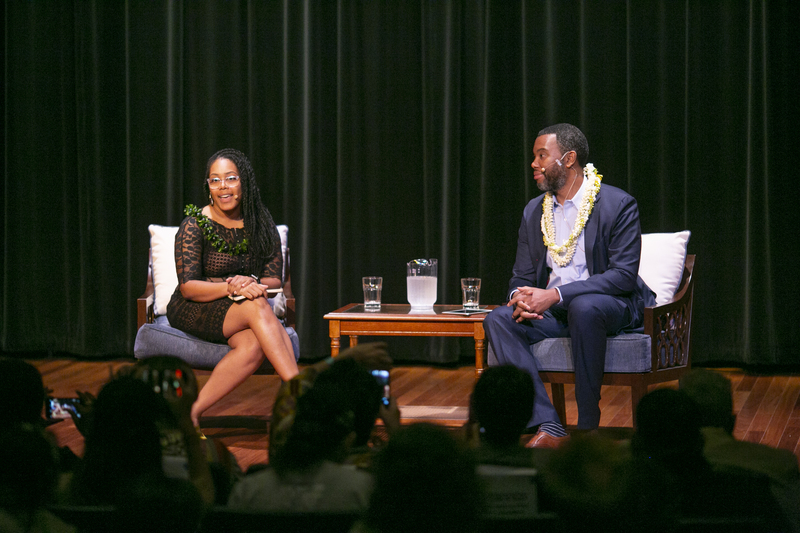 “What do you think about the presentation of Hawaiʻi in President Obama’s memoir?” Coates asked. The challenge of expanding our understanding of race, identity, and systems of oppression beyond existing borders is all too real. On one level, Coates’s perspective and understanding of American history, political movements, and myth-making helped us think about how the African-American experience on the continent is relevant to race relations in Hawaiʻi and, reciprocally, Glenn’s input presented how Hawai‘i informs a deeper understanding of America. On another level, through that exchange, a more globalized landscape of questioning opened up, one which needs to be further explored and which we all are striving to plant our feet on. An intellectually charged evening. The above text is strong tesitmony to Akiemi Glenn and her Popolo Board’s hard work and its overarching vision of invoking and examining what it means to be black in the Pacific, even for those not associated with the American Black experience. Malo lava le finau!